Yao Ming received the “Outstanding Contribution Award” at the 6th Annual China Top 10 Laureus Awards on Tuesday in China. Click here for info on the other Chinese athletes who won awards, and photos from the event. Looking at the photos, it looks a lot like the ESPY Awards here in the U.S.
On Saturday, Yao (along with Mr Zhou Qifeng, the new president of Peking University) was a presenter at the 2009 CCTV/Anta Sports Personality Award Show in Beijing where he presented the Best Female Athlete of the Year award. Yao Ming was also there as a nominee for the Special Contribution Award. He knew beforehand that he had little chance to win the award. He told CCTV reporters before entering the show that he did not know why he was nominated for the award in the first place. He said he was injured and sidelined for most of 2009 and did not think he had made any contribution to his sports and his team at all in 2009. 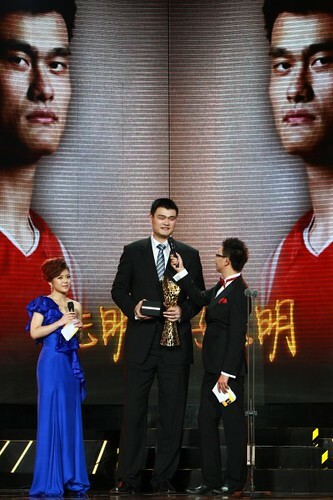 Click here for more photos of Yao at the awards ceremony. – The progress of his rehabilitation. Since coming to China in mid-December, his workouts never stopped. He practiced and trained every morning for 3 hours, including biking, strength and conditioning exercises, jogging in the pool, etc. His personal trainer Anthony Falsone returned back to the U.S. last Wednesday. Yao returns in a few days to get a check-up on his foot. – His current feeling about becoming a father, including what it was like to see a sonogram of his baby due to be born in July. Yao leads again in earnings and influence. Yi Jianlian is #4. Click here for the article. The good folks over at Sports Illustrated China were gracious enough to send me an English translation of the article that appears in their publication after Yao was awarded the 2007 Sportsman of the Year award in China. Here it is! Yao Ming is 52 years old and his basketball heroics are far behind him. He and wife Ye Li have their own family, maybe even a basketball player. They bask in nice memories of Olympic Games and Toyota Center lights and crowds. Their lives are peaceful and uncluttered. The glitz and glamour of the NBA are a distant memory. Watch the highlight movie of Yao Ming’s sports career for a moment in your mind, and then ask yourself – what will be the best moment of this film? What will be the moment when I will look back and think,yes, that’s the Yao Ming I remember, the man who single-handedly introduced millions of American basketball fans to the most populous country in the world, the man who was named SI China’s Sportsman of the Year, way, way back in 2007? Through public voting, Yao was selected as the S.I. China Sportsman of the Year. He beat out several prominent Chinese athletes, including Milwaukee Buck Yi Jianlian and last year’s winner Liu Xiang. Raymond has posted some of the photos from the article in the forum. And for a limited period of time, you can see some of the same photos they are displaying on the S.I. China home page at http://www.sichina.com.